Led by Ernest Shackleton on board the Quest, this expedition undertook extensive scientific work in the Antarctic and sub-Antarctic areas. Shackleton died of a massive heart attack during the expedition and was buried on the island of South Georgia, at his wife’s request. Frank Wild took charge of the expedition after Shackleton’s death and they visited many islands undertaking extensive scientific surveys. Originally Shackleton had planned to lead an expedition northwards into the Arctic, however, with the withdrawal of funding from the Canadian government he was forced to rethink his plans. Shackleton turned his thoughts southwards for one last time and with funding from his friend John Rowett made plans for another trip to the Antarctic region. The main motivation was to collect scientific data in Antarctic and sub-Antarctic areas. In doing this they would circumnavigate the continent and sail along previously unvisited stretches of the Antarctic. Shackleton wanted to explore many of the little known islands of the Southern Ocean and confirm or disprove the reports of land. The scientific work was to include taking meteorological examinations, magnetic observations, zoological studies, geological surveys, hydrographical and oceanographical work, as well as the charting of little known islands. Photography was made a key feature in this expedition and a lot of photographic equipment was taken. A competition was held through the Daily Mail to find a boy scout to work as the ship’s boy on the journey; the competition was so fierce that Shackleton would choose two boys to accompany them, although one boy would be forced to return home due to severe seasickness. They set sail on 17 September 1921 on board the Quest. On the journey southwards they had numerous problems with ship‘s engines, at Rio de Janeiro the expedition lost a month as repairs were undertaken. Whilst in Rio de Janeiro Shackleton suffered a heart attack but would not let Macklin, the ship’s doctor, examine him. This delay resulted in Shackleton changing his plans and sailing directly to South Georgia. Quest arrived in South Georgia on 4 January 1922. Shackleton looked through binoculars towards the coast where he and his companions in 1916 had traversed the inhospitable terrain to raise the alarm concerning the fate of the crew from the Endurance. At 2am on January 5 1922 Shackleton called for his physician asking for sleeping pills complaining that he was in pain and the aspirin he had taken was not working. The physician warned him that he needed to take things easy and stop working so hard, Shackleton replied with the words “You are always wanting me to give up something. What do you want me to give up now?” These were Shackleton’s last words, shortly afterwards he suffered a massive heart attack and died. He was 48. At first Shackleton’s body was sent to Montevideo to be returned to England, however when Lady Shackleton heard the news of her husband’s death she asked that his body be returned to South Georgia where she thought he would have wanted to be. He was buried in the whalers’ graveyard on South Georgia at Grytviken, overlooking the stormy sea. Meanwhile the command of the expedition passed on to Frank Wild. They headed southwards through the Weddell Sea to the Elephant and Clarence Islands, and then back up to South Georgia where they erected a cairn in Shackleton’s memory and visited his grave. From here they went to Tristan da Cunha, where they carried out a number of depth soundings. There they met with the islanders of Tristan da Cunha, giving them supplies and the ships doctor provided medical assistance. From there they travelled to Gough Island where they scaled its highest point and undertook a survey. On 3 June they set off for Cape Town arriving into Table Bay on Sunday 18 June. Leaving there they sailed on to St. Helena and to St. Vincent to gather more scientific results to compare to their other scientific gatherings. 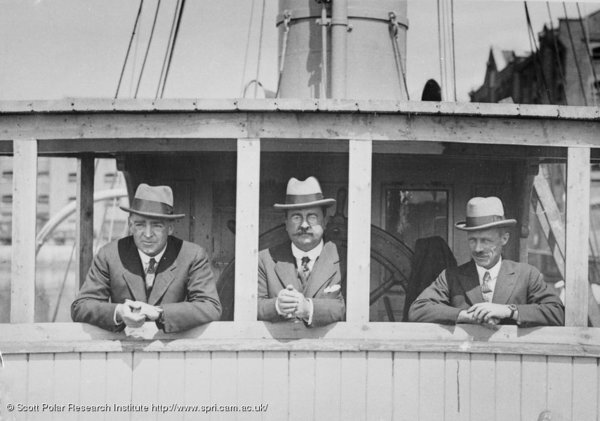 On 16 September 1922 they entered into Plymouth Sound bringing massive amounts of scientific data with them, including valuable deep-sea soundings. In addition, the expedition had proved the non-existence of New South Greenland. This expedition is best remembered for being Shackleton’s last voyage, although scientifically the expedition was a big success. Wild, F. (1923) Shackleton’s Last Voyage. The Story of Quest. Cassell and Company Ltd.
British Museum (Natural History) Report on the Geological Collection Made During the Voyage of Quest. (1930). Headland, R.K (2009) A Chronology of Antarctic Exploration, A synopsis of events and activities from the earliest times until the International Polar Year, 2002-2009. Bernard Quaritch Ltd. This entry was posted on Wednesday, November 5th, 2008 at 4:34 pm	and is filed under Antarctic, Shackleton-Rowett Antarctic Expedion 1920-22. You can follow any responses to this entry through the RSS 2.0 feed. Both comments and pings are currently closed.